Forever changing the landscape of how surf report information is delivered and challenging the status quo of what you’ve come to expect from a surf watch, Nixon introduces the Ultratide powered by Surfline. An evolution in surf watch technology, Nixon’s Ultratide is the product of extensive research, development and an exclusive partnership with Surfline– the world’s largest and most credible source for surf conditions reporting. Forget what you think you know about surf watches, the Ultratide is like nothing you’ve seen before; it’s the smartest and most revolutionary surf watch in the market today. The Ultratide features Bluetooth® wireless technology to provide you with real time data, including wave height, swell direction, wind direction and speed, water and air temperatures, Surfline rating, and custom Surf Alerts. The Ultratide provides the user with 10 live data points of forecast details, which is 10x the amount of data typically found in surf/tide watches. Browse the entire Surfline network of spots – over 3300 and growing – and select your favorites. 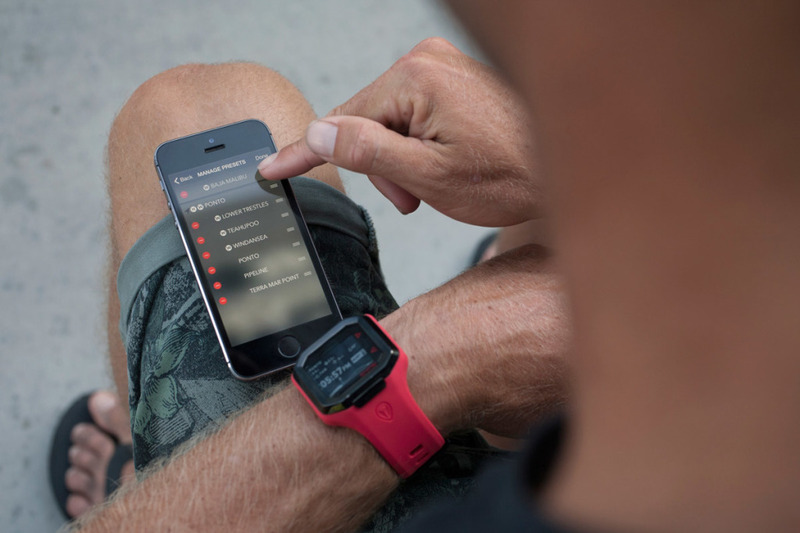 Set up custom alerts for each spot and the Ultratide will make sure you never miss an epic session again. POWERED BY SURFLINE The Ultratide is the result of an exclusive partnership between Nixon and Surfline. All of the Surf Report Data is provided by Surfline, the world’s largest and most credible surf report agency. 10X the DATA Traditional surf watches feature just one single data point: tide info (predicted and pre-programmed). With the Ultratide you can quickly reference 10x more data than ever available before. REAL TIME Via a Bluetooth connection, the Ultratide provides all of its data live and in real time. You’ll always stay connected to what’s happening at your favorite surf spots. TRACK & SHARE YOUR SESSIONS Connect with and follow your friends. Record, rate, and share your sessions. CUSTOM SURF ALERTS Program your Ultratide to notify you when Surfine rates the conditions at your favorite spots “GOOD” or “EPIC”, or select your perfect conditions including: wave height, swell direction, tide, water temp, air temp, wind speed and direction, etc. and the Ultratide will alert you when you should go surf. WIRELESS The Ultratide is 100% battery-powered, you never need to plug it in and recharge it. The Ultratide battery is designed to last 1-2 years (depending on usage). Nearly all other smart watches in the market require recharging via USB cable. LIFETIME BATTERY SERVICE In addition to a long-lasting battery, Nixon will service your Ultratide and replace the battery for free, for life. TEAM TESTED, APPROVED & CUSTOM BUILT The Ultratide is a result of nearly three years of extensive research and development, and rigorous team-testing by some of the world’s best surfers. More information on the Nixon website.